So....WHAT IS ETHNIC COTTAGE DECOR? Add a LOT of IMAGINATION to all of the above! So you see, it's the juxtaposition of interior elements of a global, cultural nature plus a warm, homey cottage atmosphere. It adds up to WOW! This is the most comfortable, homiest home I've ever been in! I love how everywhere you look there's something interesting to see. Is that African or Indian? 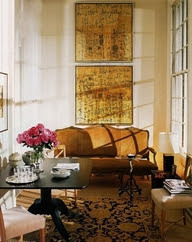 I love this room and yet my husband would love it too. You've got things I've never seen anywhere else! The last is my favorite! Why would anyone want a "cookie cutter" home? 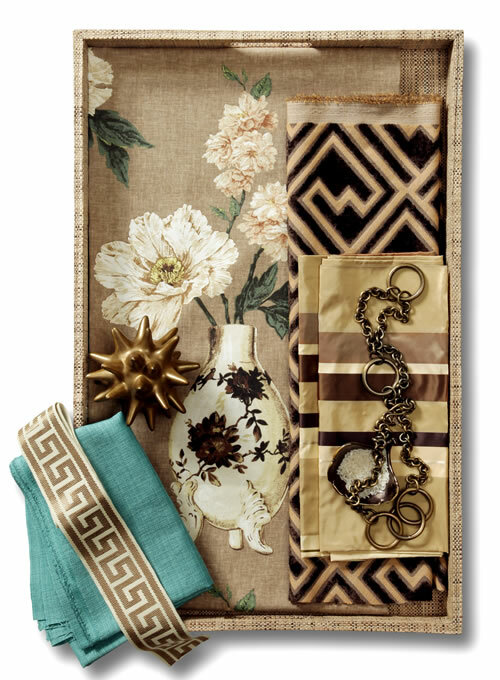 Who wouldn't want their home to be personal and represent themselves? 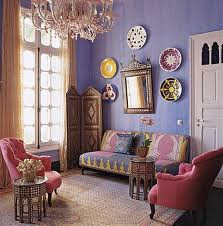 For this blog explaining Ethnic Cottage Decor, I'm going to give you some samples of my own home as well as some excellent examples I've found recently on the internet. I like to attribute photos to the source whenever possible. If it's a photo from pinterest or somewhere that doesn't have attribution, I'll only use it if I'm so smitten I simply can't NOT use it! PLEASE feel free to let me know the source if you are sure of it! 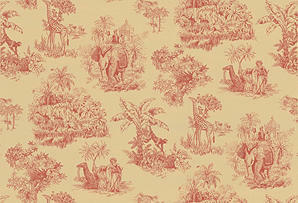 This is my blog's main photo and it's a wall in my dining room. I did the wall one night when I was too excited to sleep because I was going on a trip to see my bff the next day! I took 4 old books and one vintage music sheet book, a can of spray glue, and went to town! I worked fast because I loved seeing it develop...it took only about 3 hours. I had a young man visit my home recently to fix my computer. I could see he was staring at something and I said, "What are you looking at?" He smiled and said, "That wall. It's rustic. I like it." Great praise from a techy who hadn't said 10 words to me! I certainly wasn't thinking rustic when I did the wall. 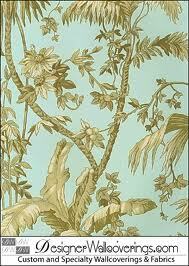 I just considered it a neutral backdrop. So then I added books. 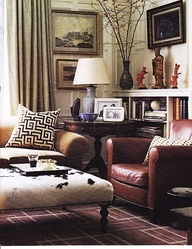 BOOKS, MAPS & GLOBES always give character to any room and are a quick and inexpensive go-to for Ethnic Cottage decorating. I then added a shelf and some art, a pith hat, and an old butterfly net. Adding an oil painting I've had for years and small set of antlers a friend gave me and voila! Ethnic Cottage! BTW, my friend uses almost all of any animal he kills, including making venison jerky. I do love taxidermy but I don't want anything that was killed for sport or fun. 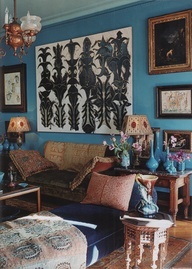 I love this living room found on pinterest.com. 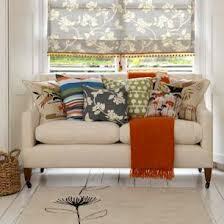 It's got the warm elements of cottage: lovely color, oversized comfy furnishings, homey little touches. 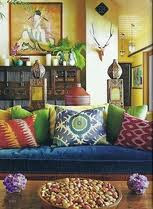 And yet it has the antlers, the pottery displayed prominently, the ikat style pillows and the eclectic art. 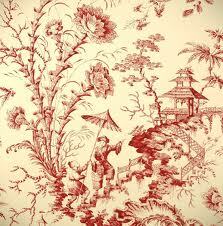 The sum total is Ethnic Cottage! 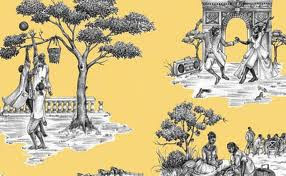 Below is a simplified example of Ethnic Cottage from pinterest.com. 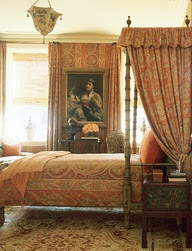 You can see the bed, the colors and the architecture have the cottage feel. 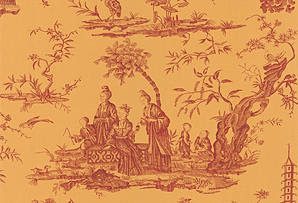 Then they added the Asian art! 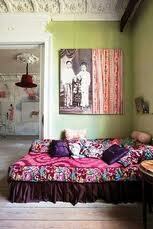 Gives the room a whole different feel and causes the bedroom to become...Ethnic Cottage. 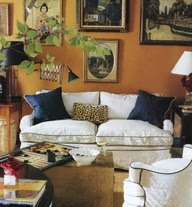 This is one of my favorites from interiordesignpro.org - no doubt because of the colors! 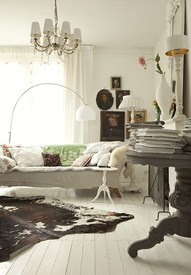 I also love the use of antiques including the Queen Anne chairs, and the chandelier - elements of Cottage style. 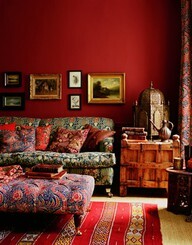 Then look at that kilim fabric on the sofa, the small Indian shisham tables and the shape of the mirror - all Ethnic, global style. Yum...this room has it all! 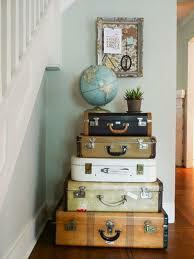 I have "played with" vintage suitcases for years. I have been COLLECTING since I was a child...hats, vintage jewelry, art, all the dogs and cats my parents would allow :-) My vintage luggage collection began when my Grandpa gave me his old suitcase filled with his much-used and beloved art supplies. What a treasure! 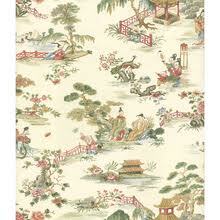 ANYTHING SENTIMENTAL contributes to the Cottage part of Ethnic Cottage. I'm a sucker for those pith helmets! Really, any hats! Note the Cottage furnishings. 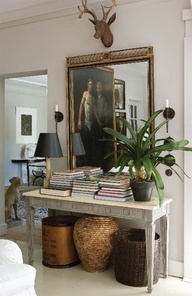 WICKER AND/OR RATTAN are always good contributions to the Ethnic Cottage style. 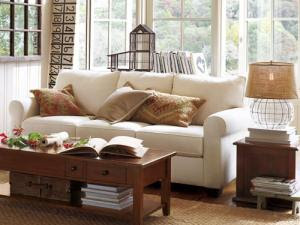 By Pottery Barn. 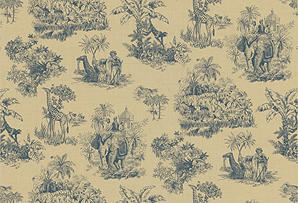 A great collection of fabrics and trims from Calico Corners. 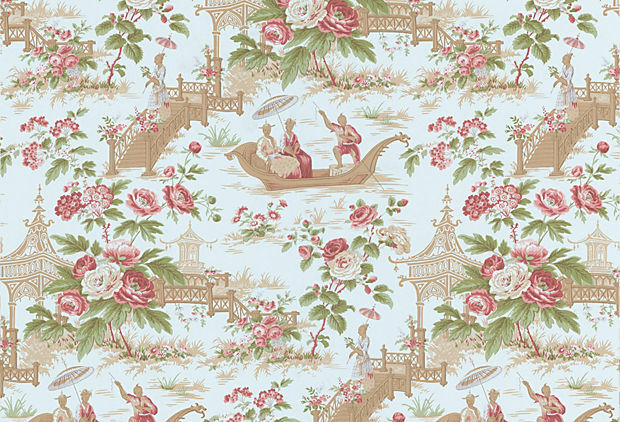 You can never go wrong with CHINOISERIE FABRIC OR WALLPAPER. 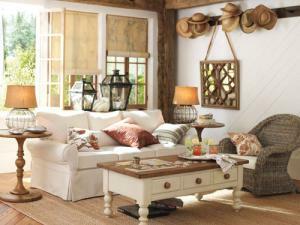 It has both the ethnic and the cottage feel! 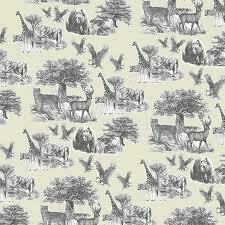 Global or animal TOILEs are also a good bet! One of my faves. Sheila Bridges did her own interpretation of toile and calls it Harlem Toile. So clever and so beautiful! 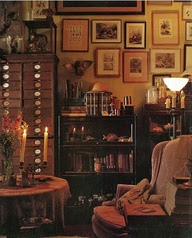 Interior Alchemy by Rebecca Purcell - A treasure of a book!!!! 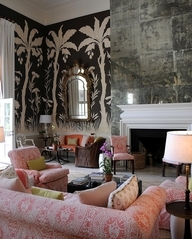 IN THIS STYLE OF DECOR! You should ENJOY your home and your things.